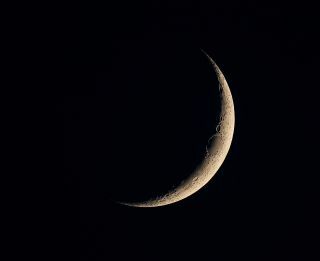 The Islamic calendar is tied to observations of the moon — the new month starts when a new moon is observed. John Nelson took this image of a thin crescent moon on May 31 using a Canon 60D camera attached to an Explore Scientific 127mm telescope. Slooh Community Observatory will give viewers a rare sight of the new moon today (Aug. 5) from its telescope in the Canary Islands in a broadcast that will also discuss the importance of the new moon in the Islamic calendar. The broadcast starts at 2 p.m. EDT (6 p.m. GMT) and is available at live.slooh.com. You can also watch it here on Space.com, courtesy of Slooh. Viewers can take part in the discussion on the Slooh website or on Twitter (by tweeting @Slooh).